As we continue with our series, “Bed Bugs in Institutions”, we have received many inquiries on how to determine if bed bugs are to blame for the bites that patients experience while in certain healthcare institutions. As stated last week, it is difficult to determine if bed bugs are to blame for the bites and detrimental health effects of those in institutions. In most instances, the primary method of determining if bed bugs are present is if it is confirmed that bites are received during the night. Circumstantial evidence is exceptionally important in determining if bed bugs are present in a healthcare institution. This week, we are going to continue to expound on this issue in order to clarify the signs of a bed bug presence for our readers. 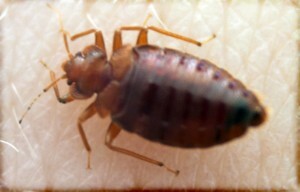 Those that are subject to the feedings of bed bugs may show a reaction immediately; however, in some instances, the reaction may take up to two weeks to occur. If an inspection is performed in areas where bed bugs are suspected and no evidence is found of their existence, the culprit is probably another type of insect. If the bites occur outside the institution, mosquitoes and fleas may be to blame. This is especially true if the weather is warm outside. If puncture wounds are present where patients and others in the institution are bitten, the culprit is likely a bite from a spider or another type of insect.